Only harmony can resonate with harmony. 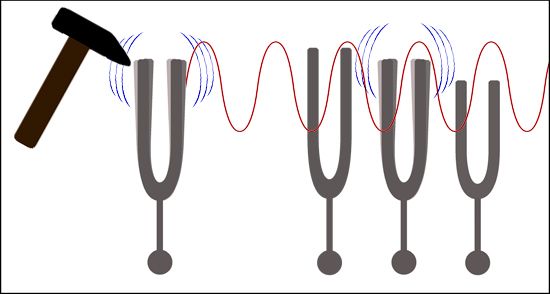 For example, if one strikes a tuning fork and other tuning forks are in the area, only those tuned to the same note/frequency will also start to vibrate. All the other tuning forks will remain silent—they won’t react. 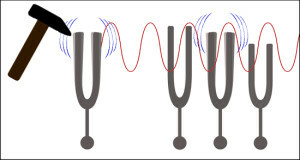 Only tuning forks tuned to the same note/frequency as the original fork will vibrate in response. The law of resonance also applies to the non-visible field and ensures that frequencies outside of the visible light spectrum (frequencies which are not harmonious)do not resonate. In other words, people, animals, and plants oscillating in a harmonic field will continue to do so no matter what other frequencies are in the area. Imagine you are having a drink with friends in a café and someone nearby call s out the name “Daniel.” If your name isn’t Daniel, you might not even notice. Consciously, you may not perceive it at all because it doesn’t resonate with you. But if your name is Daniel, resonance is inevitable. You might even stand up and look around to see who called your name. The same principle comes into play when the electromagnetic energy field of a house is “fed” frequency information that results in the house singing a “different tune,” a tune of harmony. The law of resonance then dictates that everything in the energy field must oscillate at the harmonic frequency. In turn, this means that non-harmonic frequencies cannot resonate. They are ineffective and the system cannot perceive them. Accordingly, these frequencies can no longer irritate our bodies. Next: Part 7: How noticeable is the harmonisation?